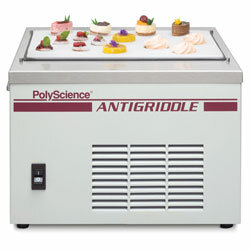 As the name suggests, The PolyScience Anti-Griddle is a flat-top cooking apparatus that uses extreme cold instead of extreme heat to modify the texture and flavors of food. The cooking surface is a metal sheet approximately 15" x 9" that is cooled to -30ºF by specialized refrigeration gear. So, for this low-tech hack, you simply need to sandwich dry ice between two sheet pans. Hey, I said low-tech. What did you expect? At -79ºF and lower, dry ice is considerably colder than the Anti-Griddle. Do NOT touch Dry Ice. You can suffer some pretty serious injuries here, and you need good ventilation in your workspace. Make sure you read the CDC guidelines on handling dry ice. Use similar precautions in handling the sheet pans. Use some non-stick spray to make it easy to flip and remove items. Check out PolyScience's guide for some other ideas on what you can do with this technique.